This week in our WiCipedia roundup: SheHacks hosts largest female hackathon in world; the birth of diversity data; wear your geek on your sleeve; and more. Totally agree, Kelsey! I think the clothing is a fun idea but their marketing has a long way to go to match the desired demographic. 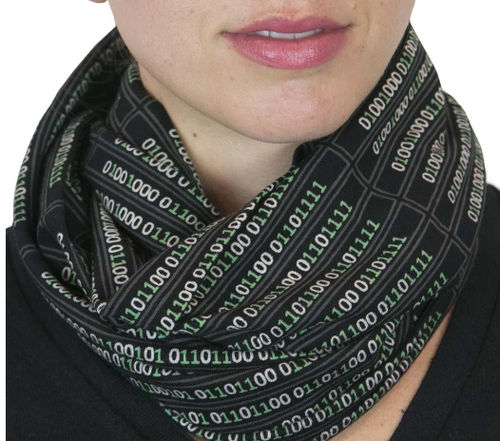 Binary code scarf is pretty cool but I looked at the website and I'm not sure how dressing like Miss Frizzle makes you "look like a scientist" in the context I think the creators were going for. The designs are interesting but seems like more of what a science teacher might wear versus an engineer at a conference. Maybe I'm too culturally conditioned? Glamour article was interesting and I'd have to agree -- women have been stepping up and showing up for years, but if you climb too high you're "unlikeable" and "trying to hard." A male CEO, on the other hand, might be "unlikeable" but people would probably just call him "successful" and leave it at that.